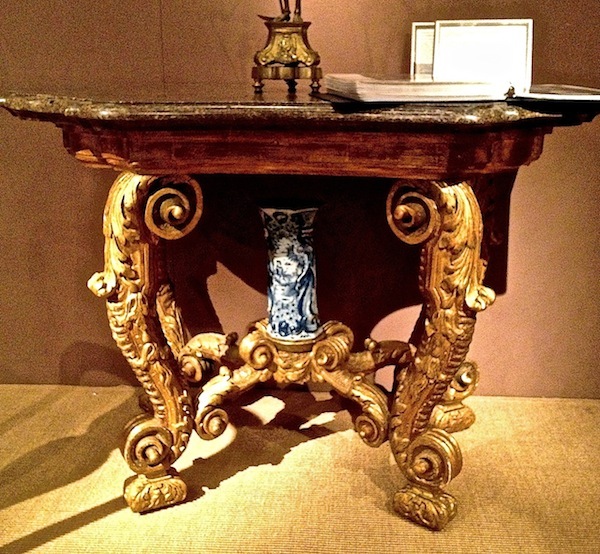 Before the throngs arrived on opening morning at the Winter Antiques Show, I was delighted to attend the Designers’ Preview sponsored by 1stDibs. 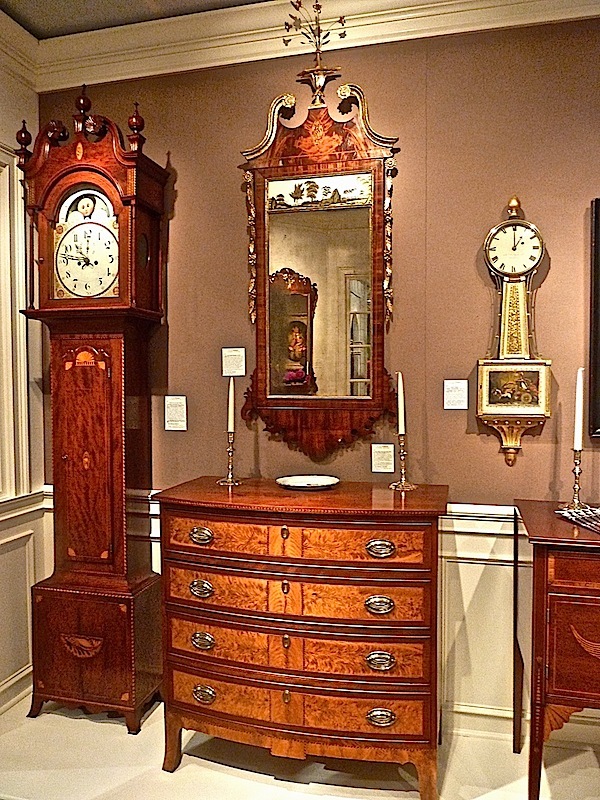 For a quiet hour, we were able to leisurely peruse the offerings at one of the most respected antique shows in the country and the only major show in New York that donates all of its profits to its beneficiary charity, the East Side House Settlement. 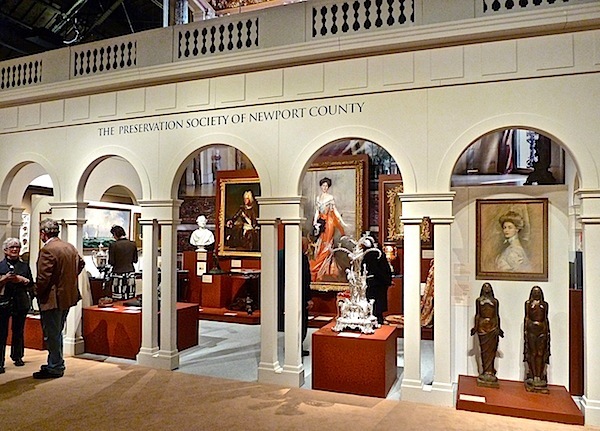 This year’s loan exhibition, Newport: The Glamour of Ornament, celebrates the Preservation Society of Newport County with selections from eight of the historic Newport Mansions. This year’s show is beautifully designed, with handsome architectural elements and a fresh, clean look. Booths maintained individual styles within the general framework. 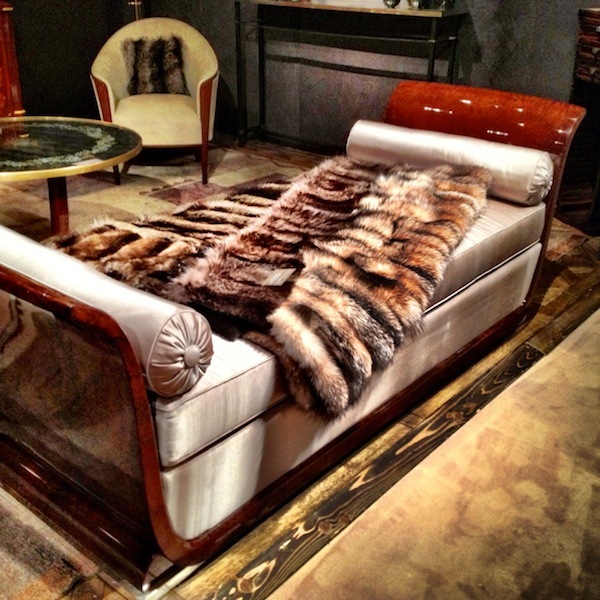 One of the most elegant is that of Maison Gerard, whose collection of Jules Leleu pieces, such as the gorgeous walnut daybed above, is a standout. 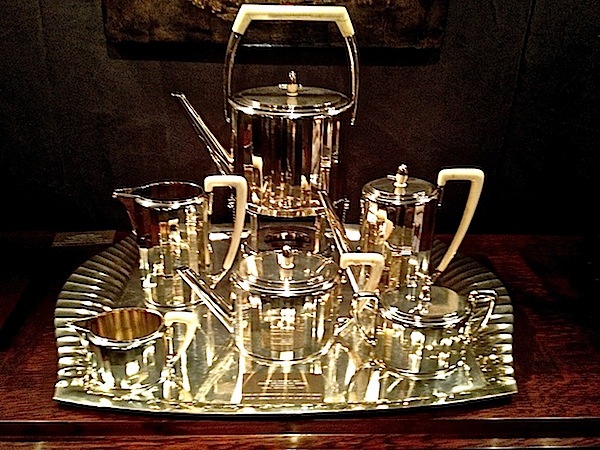 There is also this stunning Viennese art deco tea service from Brüder Frank. 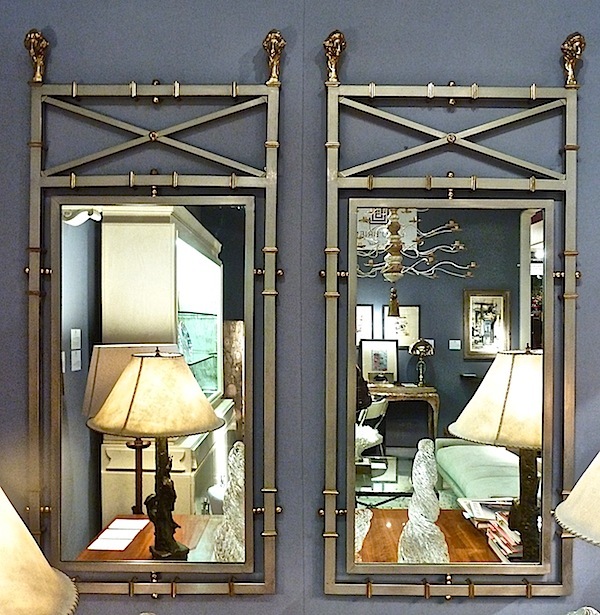 to these handsome Italian neoclassical mirrors with distinctive ram’s head finials. to the folk paintings at Joan Brownstein. 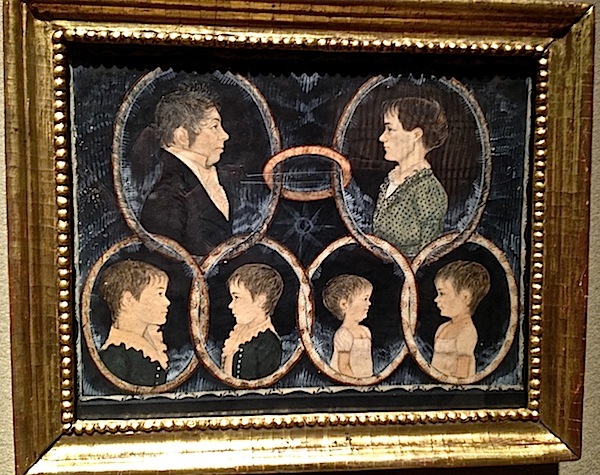 This portrait from 1813 portrays six members of the same family, the parents interconnected by a wedding ring and the children similarly linked – so charming. 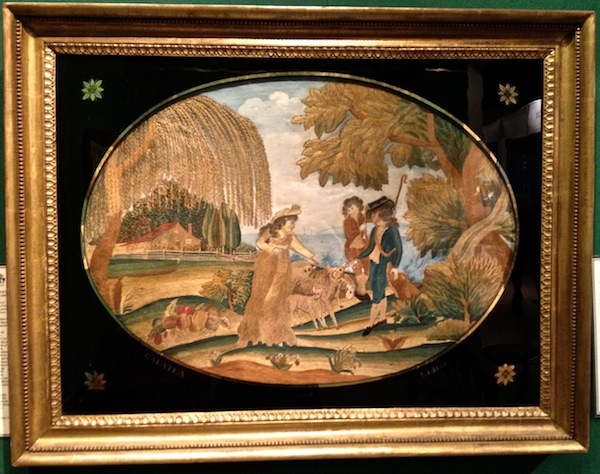 I love needlework and this 1803 memorial by Mary Lamson from Stephen & Carol Huber depicts a woman walking with flowers toward a monument. The eglomise glass is signed and original as is the giltwood frame. Architect Len Morgan designed an amazing installation for his and partner Angus Wilkie’s Cove Landing booth. I went back several times to try and get a better shot but there was always a group lingering admiring both the wares and the cozy shop-like environment. It’s a must see if you attend the show. 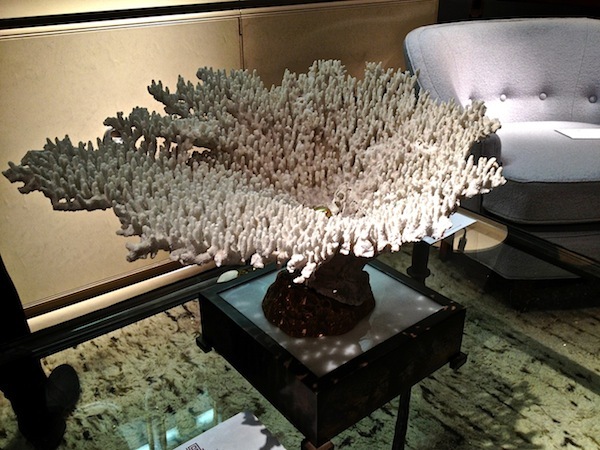 Several of well known New York dealers have truly outstanding pieces. 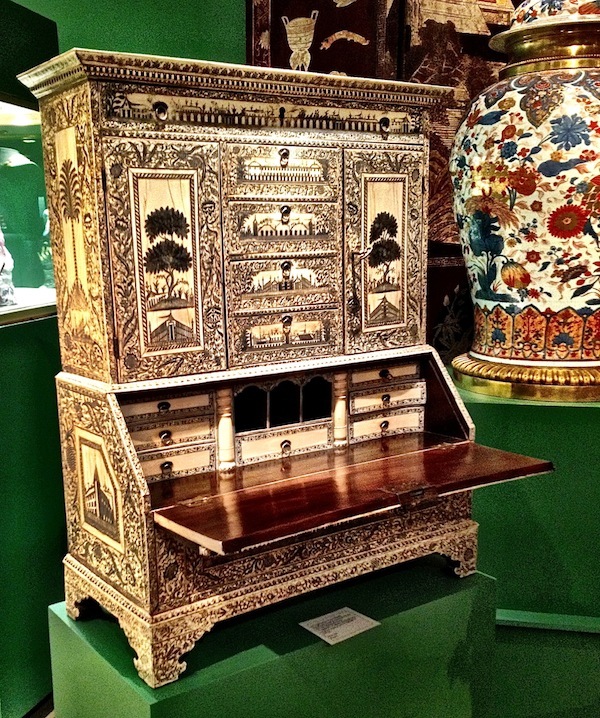 This Anglo-Indian miniature bureau bookcase at Kentshire shows incredible workmanship. 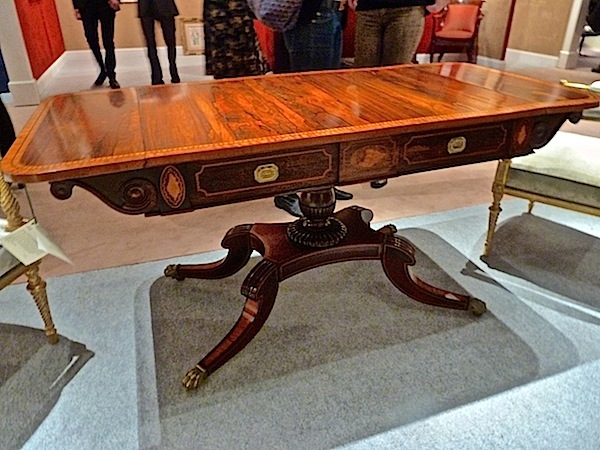 From 1790, it is ivory veneered sandalwood with an elaborately fitted interior. I can’t imagine how long it must have taken to painstakingly execute all the intricate decoration on this piece. 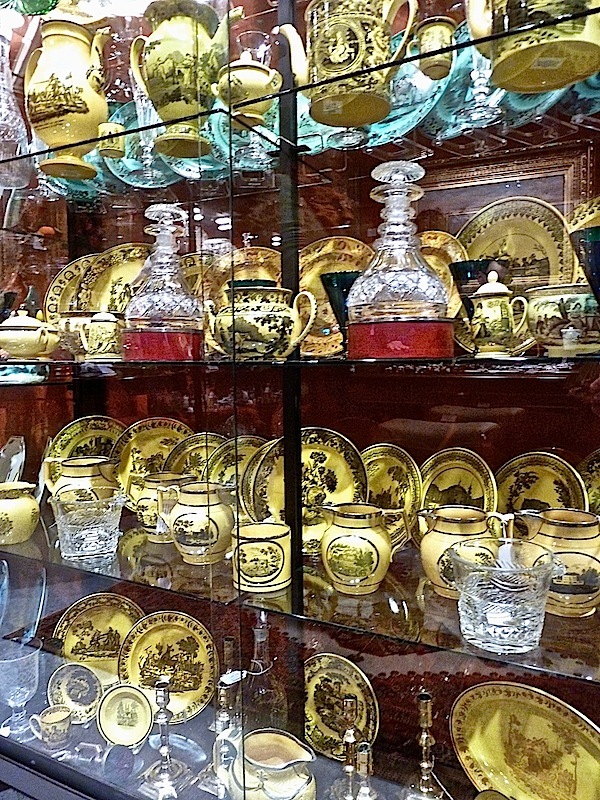 Another perennial favorite is Hyde Park Antiques. 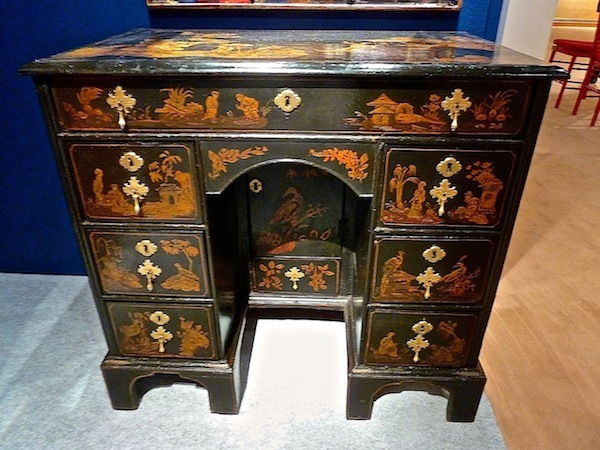 This early 18th century Queen Anne black japanned dressing table caught my eye. 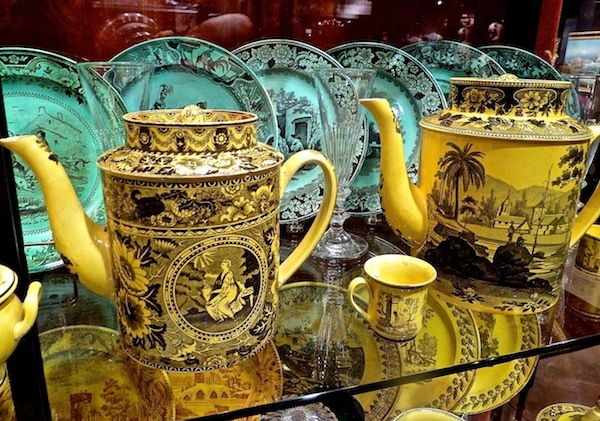 With beautiful gilt chinoiserie, it is the type of piece that would enhance any style bedroom. 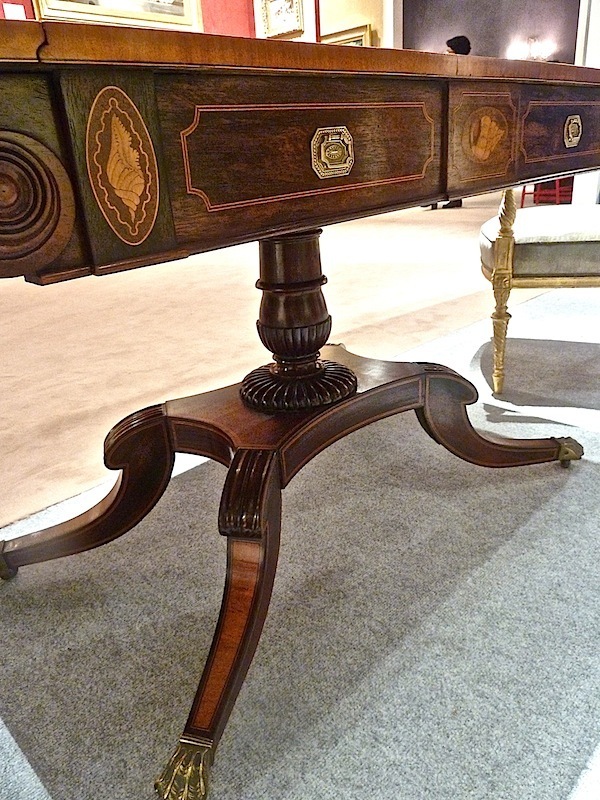 This type of classic regency table is always in high demand. Of beautiful rosewood, it has lovely satinwood banding and dentil inlay. 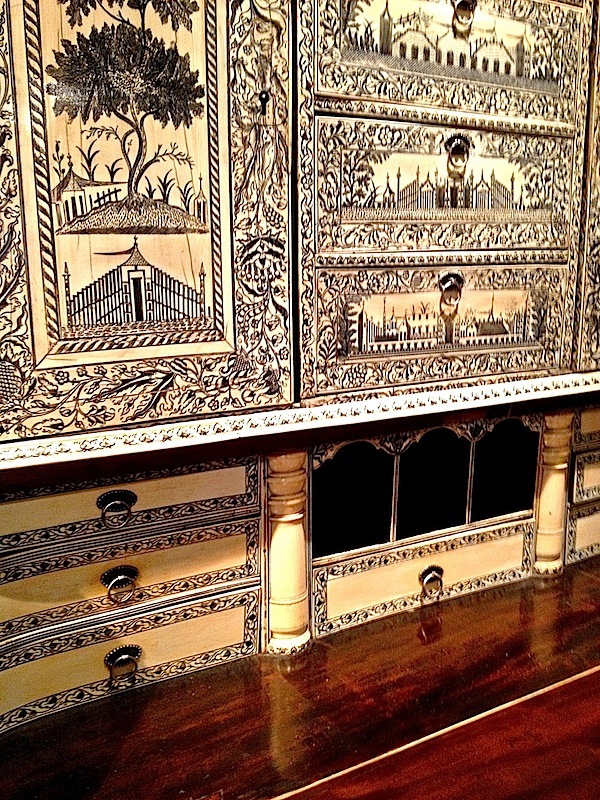 With exceptional detail, it displays pretty shell inlaid panels and elegant carvings. 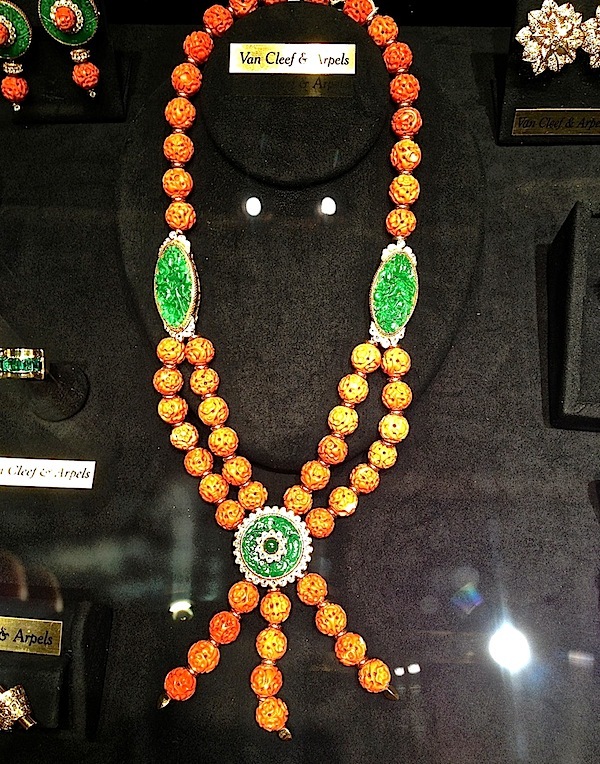 Many of us were taken with the large colorful collection of Creil at Taylor B. Williams. The yellow is fabulous but the green is even more difficult to find. 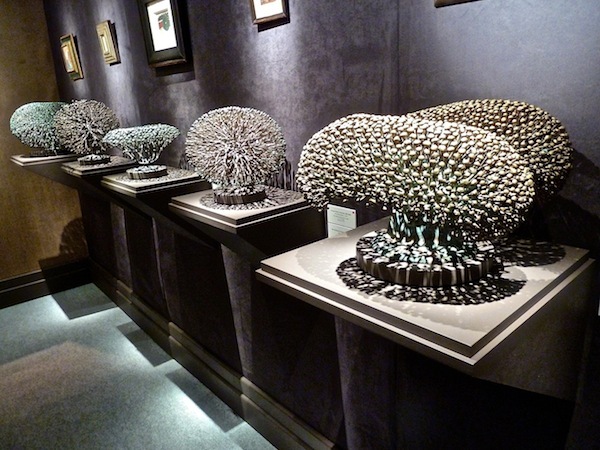 And several of us had similar instagrams of this graphic presentation of Harry Bertoia bronzes at Jonathan Boos. Naturally, I had to check out the jewelry. 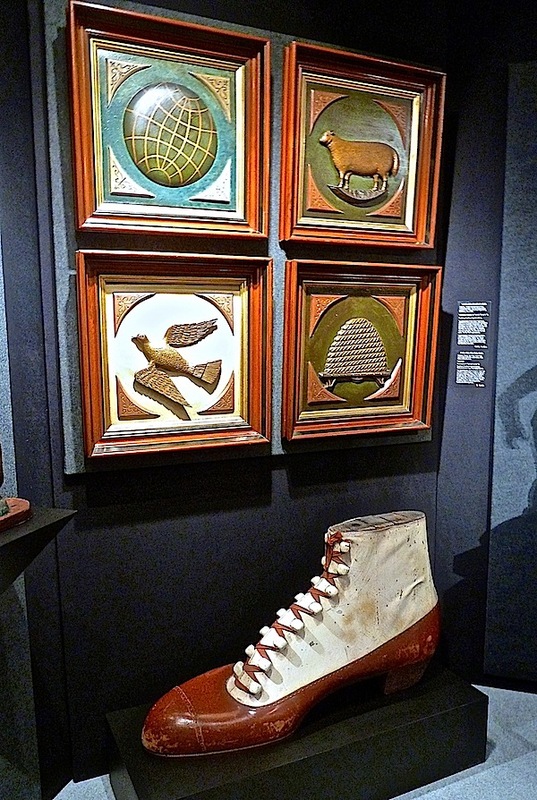 Macklowe Gallery always has an excellent collection and this was no exception. Two of my best colors come together in this stunner from Van Cleef that plays into the exotic themes so prevalent in fashion these days. 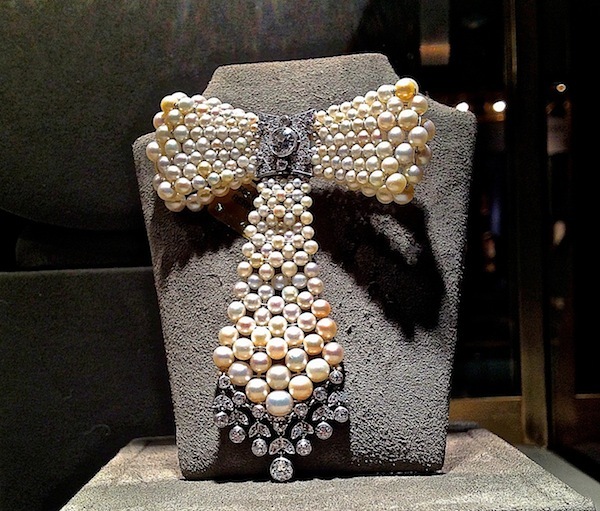 I predict pearls are going to be in great demand again after Chanel’s spring show. 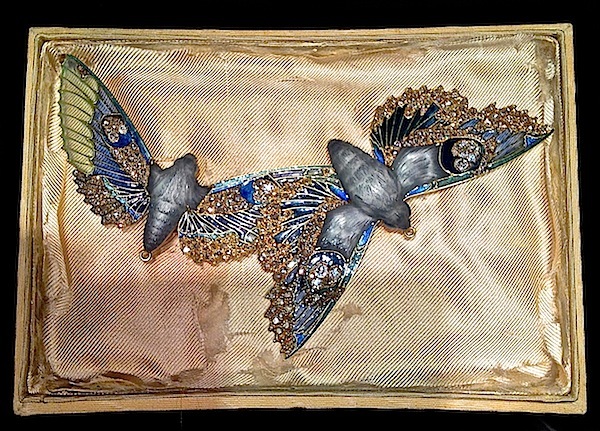 This magnificent Cartier brooch would the perfect addition to any neckline or shoulder. 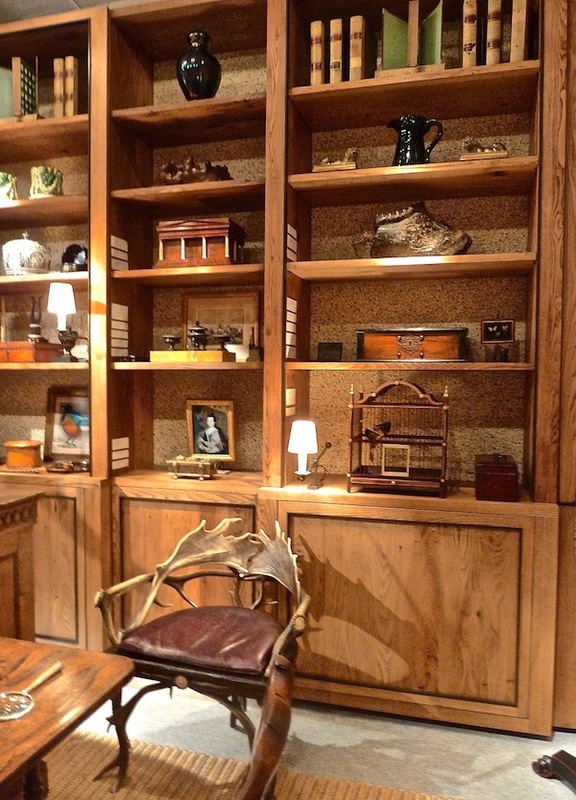 While antique, it feels very of the moment in shape and scale. Tonight I will be attending the popular Young Collector’s Night at the show and will hopefully be able to bring you a few more glimpses from the impressive collections. This entry posted in art, design, furniture, gifts, interior design, jewelry. 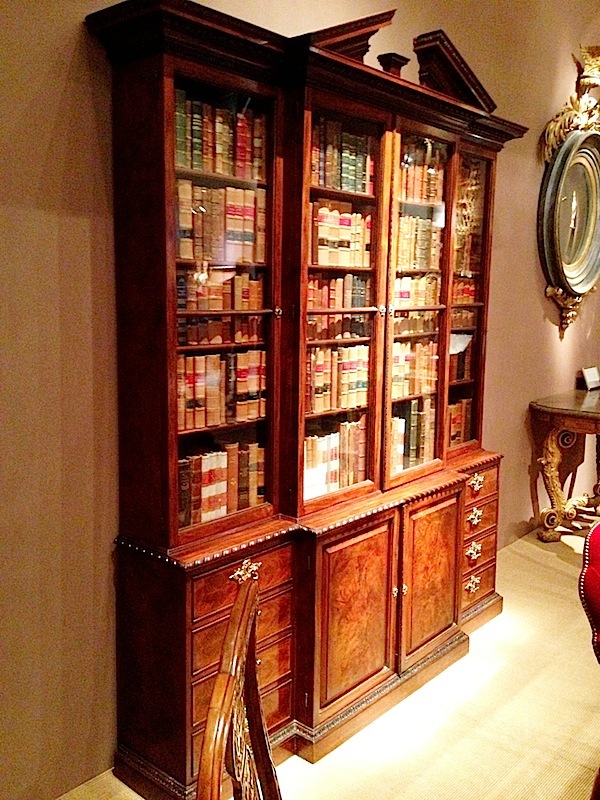 Entry Tags: antiques, Winter Antiques Show Bookmark the permalink. The ivory~sandlewood secretary pushed me near, but I am now over the edge after seeing the night moths! 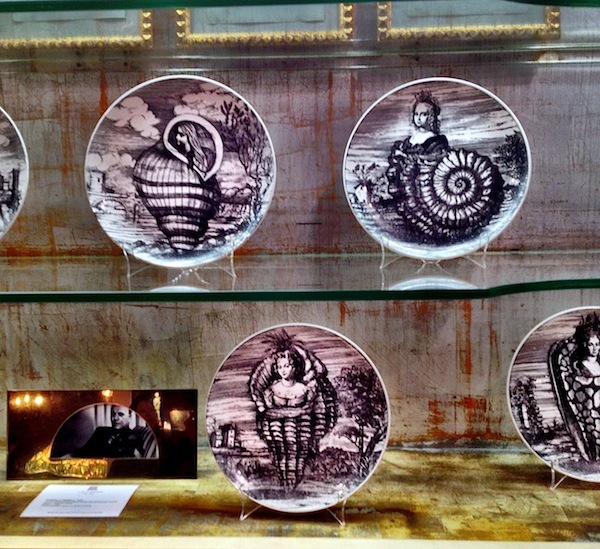 Gorgeous – thanks for the overview of an event that I will probably not get to…really stunning pieces! What a wonderful display. You have an unerring eye. I’m now obsessed with the Bertoia sculptures, as I was not familiar, and the jewelry, swoon… I have just recently found your blog and now look forward to your beautiful posts every day! I’m so happy to have found your blog amidst the crowds! Thank you. It is all so unbelievably beautiful and of the finest quality. Thanks for taking us there. Thanks for the review. I spotted my favorite pieces under the rightmost arch in your header picture: Wheeler William’s figures of Spring & Summer. Eleanor Brown of McMillen had a set in the oval dining room in her NY apartment, but hers (as well as every other set I’ve ever seen) was in dead-white plaster. Did you happen to notice whether these were bronzed-finished plaster, or if they were actual bronze casts? A feast for the eyes Q. Thanks!